A 67-year-old woman presented with metamorphopsia in the right eye. Leopard mottling was seen temporal to the fovea oculus dexter with corresponding hyper- and hypo-autofluorescent lesions on fundus autofluorescence. Spectral domain-optical coherence tomography revealed hyperreflective dots in the retinal pigment epithelium and choroid with subretinal fluid (SRF). Intravitreal bevacizumab was administered with which SRF resolved, albeit with increase in the areas of mottling. The patient was diagnosed to have metastatic ductal carcinoma of the right breast. It is important to bear in mind that the well-known entity of bilateral diffuse uveal melanocytic proliferation can rarely present unilaterally. Bilateral diffuse uveal melanocytic proliferation (BDUMP) is a rare paraneoplastic syndrome causing choroidal melanocytic proliferation with damage of the overlying retinal pigment epithelium (RPE) and retina. The primary malignancy is said to produce trophic factors promoting uveal melanocytic proliferation. There are a sizeable number of case reports in literature describing BDUMP and its clinical and imaging characteristics. It has been reported secondary to gynecological malignancies in women and gastrointestinal (GI) tract or respiratory tract in men. We present a rare case of unilateral DUMP and multimodal imaging of this entity. A 67-year-old woman presented to us with a history of rapidly progressive vision loss and metamorphopsia in the right eye since 3 months. Best-corrected visual acuity (BCVA) was 20/60, N18 oculus dexter (OD) and 20/20 N6 oculus sinister. Anterior segment was unremarkable oculus uterque. There were alternating dark reddish-brown red oval patches of hyperpigmentation (leopard mottling) extending from superior to inferior arcade temporal to the macula OD [[Figure 1] top]. Fundus autofluorescence (FAF) showed areas of alternating hypo- and hyper-autofluorescence [giraffe pattern - [Figure 2] bottom left]. 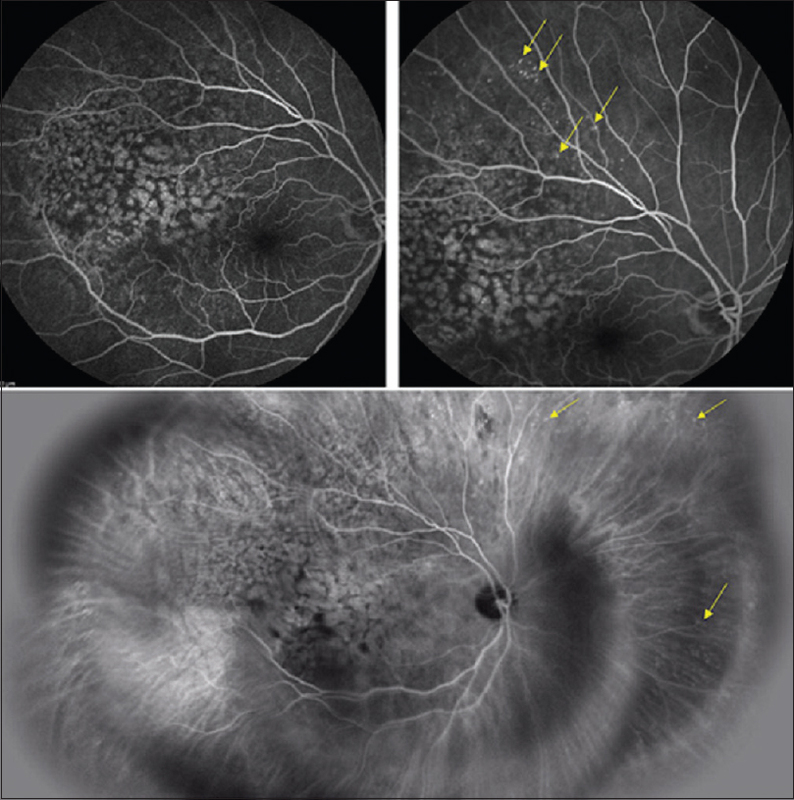 Fundus fluorescein angiography (FFA) was done which showed reversal of the pattern of fluorescence. Pinpoint hyperfluorescent dots were seen during the mid-arteriovenous phase beyond the arcades [[Figure 3] top right]. 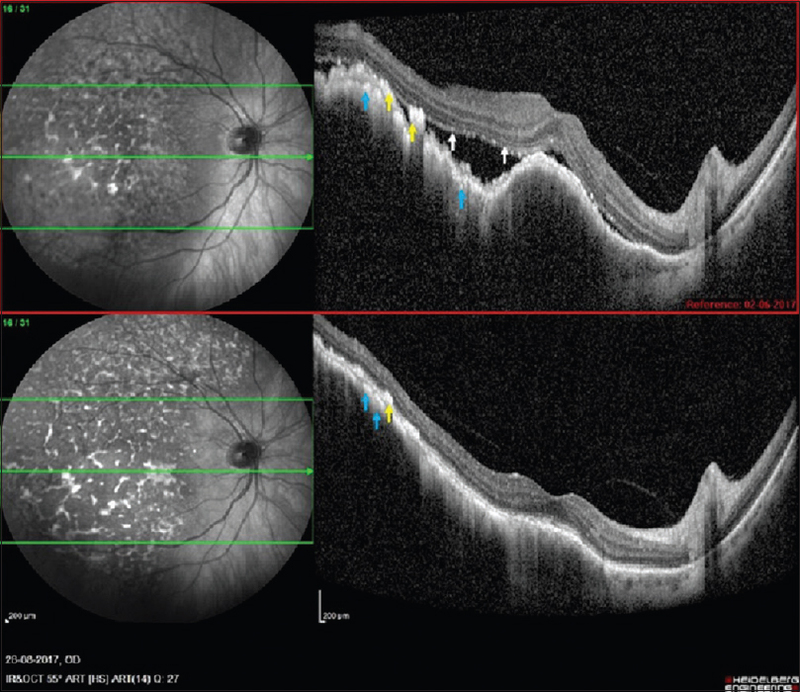 Spectral domain-optical coherence tomography (SD-OCT) (enhanced depth imaging) showed an undulant RPE-choroid complex with RPE proliferation corresponding to the pigmented patches. There were localized areas of RPE losses corresponding to the hypopigmented areas. There were scattered areas of subretinal fluid (SRF) in the area of leopard mottling. In addition, there was marked elevation of the choroid with compression of the adjacent choriocapillaris [[Figure 4] top]. 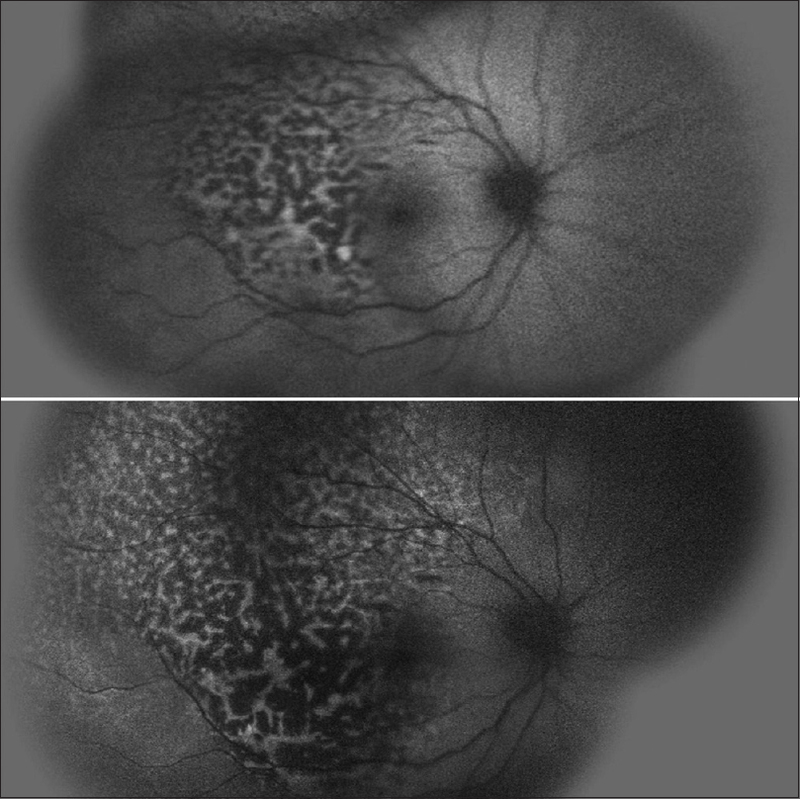 Diffusely scattered hyperreflective spots in the RPE and choroid were present. Indocyanine green (ICG) angiography showed pinpoint hypercyanescent spots throughout the fundus [[Figure 3] bottom]. B-scan ultrasonography did not show a definitive mass but showed a localized exudative detachment of the retina. The choroid was minimally thickened. The left eye showed a completely normal retina, RPE, and choroid clinically as well as on all imaging modalities. With the tentative diagnosis of DUMP, the patient was advised to undergo evaluation for a primary malignancy. The right breast had a small mass about 3 cm × 4 cm in the upper inner quadrant. The patient underwent an excision biopsy that characterized the mass as a grade III, infiltrating duct carcinoma of the breast with local lymphovascular and perineural invasion. Positron emission tomography–computerized tomography scan showed increased uptake in the right breast, deep pectoral lymph nodes, mediastinal lymph nodes, neck of the left femur, sacrum, and L3, L1, D9, D8, D5, and C4 vertebral bodies. Breast lesion showed estrogen and progesterone receptor positivity and oral tamoxifen was instituted as treatment. She received 1.25 mg/0.05 ml of intravitreal bevacizumab in the right eye. At 2-month follow-up, the SRF had completely resolved and the hitherto undulant and elevated choroid had flattened [[Figure 4] bottom]. However, the areas of pigmentation had increased considerably, seen prominently on FAF as an increase in the size of the giraffe pattern [[Figure 2] bottom]. The patient's vision improved to 20/20 p, N6. 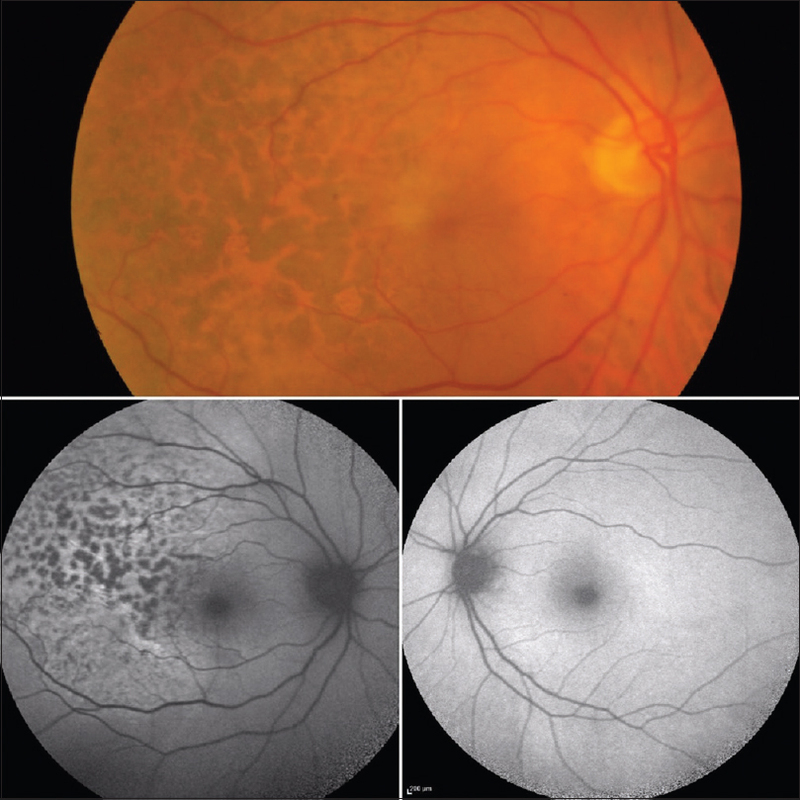 Gass described the cardinal signs of BDUMP, namely – oval red patches at the RPE, early hyperfluorescence on FFA, progressive vision loss, rapidly progressing cataracts, and multiple melanocytic tumors in the uvea. There are about 50 case reports of BDUMP in the setting of gynecological, lung, and GI cancers. Patients with BDUMP have a high risk of mortality in one to 3 years of diagnosis. A circulating antibody in the immunoglobulin G fraction termed the cultured melanocytic elongation and proliferation factor has been identified as the trophic factor causing uveal melanocytic proliferation. Reddy and Finger et al. first reported a case of unilateral DUMP in a case of metastatic lung cancer. They hypothesized that local factors produced by an anterior uveal metastasis in the affected eye caused an ipsilateral DUMP. Spaide reported a case of unilateral DUMP in a treated case of carcinoma breast. The author hypothesized that there may be variable susceptibility among the eyes, causing one eye to have more prominent RPE changes. Corticosteroids, ocular radiation, and plasmapheresis have been described in the treatment of BDUMP. Jansen et al. demonstrated the benefit of plasmapheresis in 2 cases of BDUMP and reported resolution of SRF and improvement in vision in both cases. Plasmapheresis needs numerous sessions and cessation of treatment leads to recurrence of signs and symptoms. Joseph et al. used periocular corticosteroid in a case of BDUMP and described short-term resolution of symptoms. They had to repeat the periocular injection after 5 months. Intravitreal bevacizumab use has been well documented as a treatment for metastasis and benign choroidal tumors for amelioration of SRF and symptomatic relief. Our patient also demonstrated a favorable response to intravitreal bevacizumab in terms of SRF reduction and visual improvement. The increase in the pigmented lesions despite SRF resolution in our patient, however, is suggestive of a relentless underlying melanocytic proliferation. Our case highlights the importance of having a high index of suspicion for systemic malignancy in patients presenting with unilateral leopard mottling. SD-OCT, FAF, FFA, and ICG are invaluable tools for diagnosis and management of DUMP lesions due to their characteristic choroidal, RPE, and retinal changes. To the best of our knowledge, this is the third report of unilateral DUMP and the first report of unilateral DUMP as the presenting feature of metastatic malignancy. We suggest renaming BDUMP as DUMP to be inclusive of this rare, unilateral variant. The authors wish to thank Dr. Kiran Kulkarni MD (Radiodiagnosis) for help provided in the radiologic workup of this patient. Mittal R, Cherepanoff S, Thornton S, Kalirai H, Damato B, Coupland SE, et al. Bilateral diffuse uveal melanocytic proliferation: Molecular genetic analysis of a case and review of the literature. Ocul Oncol Pathol 2015;2:94-9. Gass JD, Gieser RG, Wilkinson CP, Beahm DE, Pautler SE. Bilateral diffuse uveal melanocytic proliferation in patients with occult carcinoma. Arch Ophthalmol 1990;108:527-33. Miles SL, Niles RM, Pittock S, Vile R, Davies J, Winters JL, et al. Afactor found in the IgG fraction of serum of patients with paraneoplastic bilateral diffuse uveal melanocytic proliferation causes proliferation of cultured human melanocytes. Retina 2012;32:1959-66. Reddy S, Finger PT. Unilateral diffuse uveal melanocytic proliferation (DUMP). Br J Ophthalmol 2007;91:1726-7. Spaide RF. Unilateral diff use uveal melanocytic proliferation. Retin Cases Brief Rep 2016:1-3. Jansen JC, Van Calster J, Pulido JS, Miles SL, Vile RG, Van Bergen T, et al. Early diagnosis and successful treatment of paraneoplastic melanocytic proliferation. Br J Ophthalmol 2015;99:943-8. Joseph A, Rahimy E, Sarraf D. Bilateral diffuse uveal melanocytic proliferation with multiple iris cysts. JAMA Ophthalmol 2014;132:756-60. Lin CJ, Li KH, Hwang JF, Chen SN. The effect of intravitreal bevacizumab treatment on choroidal metastasis of colon adenocarcinoma – Case report. Eye (Lond) 2010;24:1102-3.